Michael McFadyen's Scuba Diving - Flat Rock - South Bondi Sydey residents would be aware that the waters around Sydney that were previously severely polluted by sewage are now much cleaner. There are only two main sewerage outlets that still pour sewage into the sea, these being located at Potter Point near Cronulla and Diamond Bay near Vaucluse. 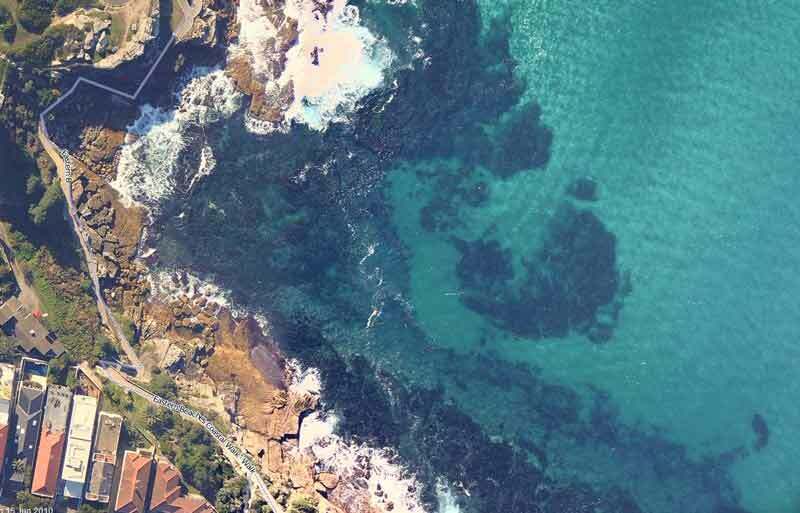 The three main sewage treatment works at Malabar, North Head and Bondi have all now switched over to the disposal of the effluent through deep-water ocean outlets that deposit it three to four kilometres off-shore. The final treatment works to come on-line was the Bondi Sewerage Treatment Plant. Prior to its connection in July 1991, the North Bondi and Flat Rock dive sites could only be dived in the right weather conditions. Flat Rock is located in the small inlet to the immediate south of the southern end of the world famous Bondi Beach. Access to the site is either from Wilga Street or Notts Avenue, Bondi. After driving to the end of either street (parking can be difficult to find at any time) look down onto the site to see if it is diveable. The sea condition must be fairly calm to dive here, so if the seas are up at all, go elsewhere. Favourable sea conditions will include slight south-easterly swells and otherwise calm seas. When you have put on your equipment, walk down the stairs onto the pathway that leads around the ocean shore. The best entry and exit point is to the right of the stairs from Wilga Street. Climb down onto the rock platform and you will see why the site is called Flat Rock. I am unsure of whether the flat rock referred to is this rock or the rocks to either side, but it is an appropriate name. Enter the water and snorkel out due east about 25 to 30 metres. The depth of the water here is about 6 metres and is a good place to start the dive. Drop to the bottom and head in an easterly direction. The seabed at first is composed of large rocks interspersed with sand patches. After 50 metres you will reach the sand bottom. Ahead is a low reef which is separated from the shoreline reef by five metres of sand. This reef is a low kelp covered reef made up of a number of very large flat rocks (is this where the name came from?). The southern side is mostly one big flat rock covered with kelp. The northern end is made up of a large number of rocks, some of which form small swim-throughs and have sand patches between them. Turn to your right and follow the edge to the south. Examine the small holes created by the overhanging rocks. A lot of moray eels and small cuttlefish can be found under the rocks. Around the rocks you will find snakeskin wrasse, yellow-finned pomfret, crimson-banded wrasse and some small blue gropers. After a short distance the reef edge turns from a southerly direction to an easterly one. You will see the rocks of the low reef to your left, much closer now. A further 20 metres along in this direction, you should head due north over the sand to the flat reef. After you have examined the reef (by swimming around and over it), continue to the north over a small patch of sand back onto the main reef. Do not head too far in this direction as it is not too interesting further on and it is normally quite surgy here. Return back along the reef to the south, keeping the rocks on your right. Back near the point where the isolated reef is closest to the shore, turn to the west and go over the rocky bottom until you reach a vertical wall. Follow this to the left and you will see what at first appears to be a number of small caves or overhangs. In fact, these are the start of three caves that run for between five and ten metres back towards the main rock platform, but you would never know it from the outside as they all appear to be only overhangs. The first two caves are on top of each other and only go five metres or so. They are normally full of bullseyes and sometimes a sleepy wobbegong. The longer cave is quite wide, although it is not too high. This cave runs parallel to the other two and is nearly always occupied by one or more wobbegongs. The exit from the cave is into an area like a large hole in the reef. You can either return through the cave or over the top. However, I was told in June 1999 that one of these caves collapsed early in 1999. I have not dived it since then to confirm this fact. Once you reach the wall again, follow it to the right in an westerly direction and then, when it disappears head due west. After 20 metres or when the depth is six metres, surface to check your bearings. It is usually and easy exit back onto the rock you started from. Fish to look for here include common stingaree, crayfish, six-spined leatherjacket, red morwong, senator wrasse, maori wrasse and other normal Sydney fish.